Super Hero Boy: Umi Shoes, Connor's favorite sandles for summer! Umi Shoes, Connor's favorite sandles for summer! Anyone who knows me and Connor will tell you that we wear sandals just about everywhere. So much so that it's not uncommon to see one or both of us sporting sandals in the winter. Though I love shoes, I just am a sandal girl always have been. I think I picked the habit up growing up in the south and from my mother who is just as guilty as I am. So needless to say the first thing Connor asked for when summer came was a new pair of sandals. Though Connor loves flip flops, just like his mom, they just do not hold up to all the running and jumping that boy does. So we needed something that would hold up to all that jumping and running and still look great. 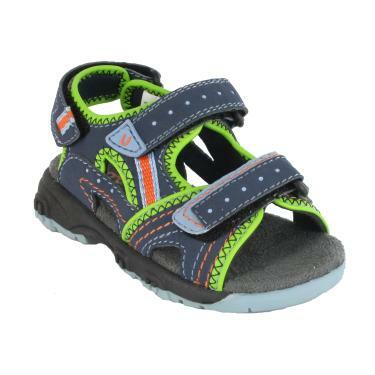 Umi Shoes has been one of our long term favorites for tennis shoes and dressier shoes and when I saw the Nyoni I knew we had his new sandals for the summer. These sandals are as well built and have the same sort of sole and insoles that you would expect from a tennis shoe. What I really love though is the fact that the straps and heel strap are all padded. We've had some real problems in the past with sandals rubbing holes in Connor's heels and these ones show no sign of that happening and I know his feet will be well supported. They also feature very heavy duty velcro straps which will take the abuse that young children put on velcro shoes. I especially love the color choices offered this year. We went with the ocean color in the Nyoni which has a green accent that runs all around the shoe. Most of Connor's wardrobe falls within blue and green and they match nicely to just about everything in his wardrobe. Though if I bought a second pair we'd get the chocolate for his dressier outfits. Don't worry girls they come in pink too! Umi Shoes offers really exceptional shoes that hold up great and look even better! Connor has several pairs that he will be passing down to Dylan and they still look awesome. If your headed over there and are looking for a great looking pair of tennis type shoes I highly recommend you check out the Oleson as well. I've been drooling over them for weeks! Visit Umi Shoes to see their entire selection! Disclosure: We were given a pair of Nyoni sandals free of charge, we were not compensated for this post in any other way. My opinions and comments on items we review are always my own and are never influenced by sponsors!